Sunday, 27 January 2019 will mark the 74th anniversary of the liberation of Auschwitz concentration camp when soldiers of the 60th Army of the First Ukrainian Front of the Soviet Red Army appeared in the grounds of the Auschwitz Main Camp and Birkenau at about 3 p.m. They had been warned that they were about to experience a history-making event and, given what was encountered, this certainly proved to be the case. Holocaust Memorial Day (HMD) was created on 27 January 2000, when representatives from 46 governments around the world met in Stockholm to discuss Holocaust education, remembrance and research. HMD has taken place on 27 January each year since then and is a time to remember the millions of people murdered during the Holocaust, under Nazi Persecution and in the genocides which followed in Cambodia, Rwanda, Bosnia and Darfur. The system of concentration camps instigated by the Nazi regime of the Third Reich 1933-45, were distributed both within and outside the borders of Germany and the strategy of ‘concentrating’ individuals in one place who did not conform to the concept of Aryanism can be traced back to the mid-1930s. The camp at Sachsenhausen near Oranienburg on the north flank of Berlin was constructed in 1936 and accommodated a range of political prisoners and ‘anti-socials’, a catch-all category which included prisoners convicted under paragraph 175 of the German penal code, which criminalised homosexuality. In line with the policy of providing visual identification of all camp prisoners, ‘175ers’ were required to have a large pink triangle sewn on to their prisoner clothing, a symbol that singled them out for particularly harsh treatment. Although Sachsenhausen, unlike Auschwitz, was not officially an extermination camp, to all intents and purposes the same outcome was achieved, Heinrich Himmler decreeing that homosexuals should be ‘corrected’ via hard work. The now notorious events in the summer of 1942 in the Klinkerwerk (brickworks) adjacent to the main camp, where approximately 200 gay men were murdered is evidence of this. 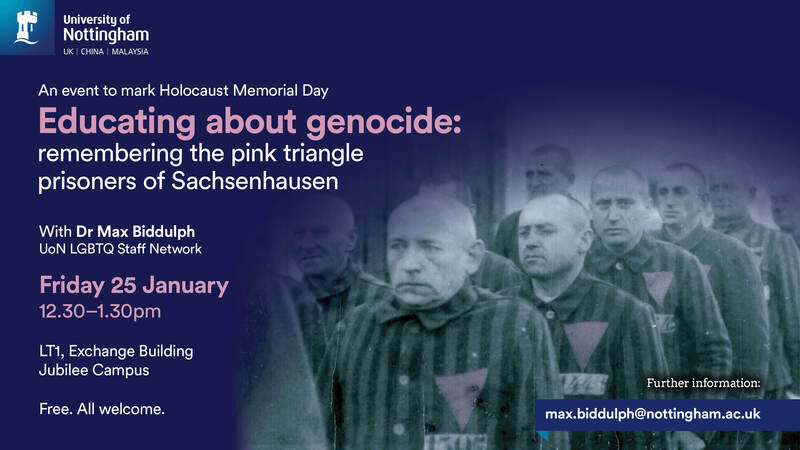 This is an event to mark Holocaust Memorial Day, with Dr Max Biddulph, UoN LGBTQ Staff Network. This event will take place on Friday 25 January at 12.30-1.30pm in LT1, Exchange Building, Jubilee Campus. Tickets are free and all are welcome. For more information, please contact Max Biddulph at max.biddulph@nottingham.ac.uk.